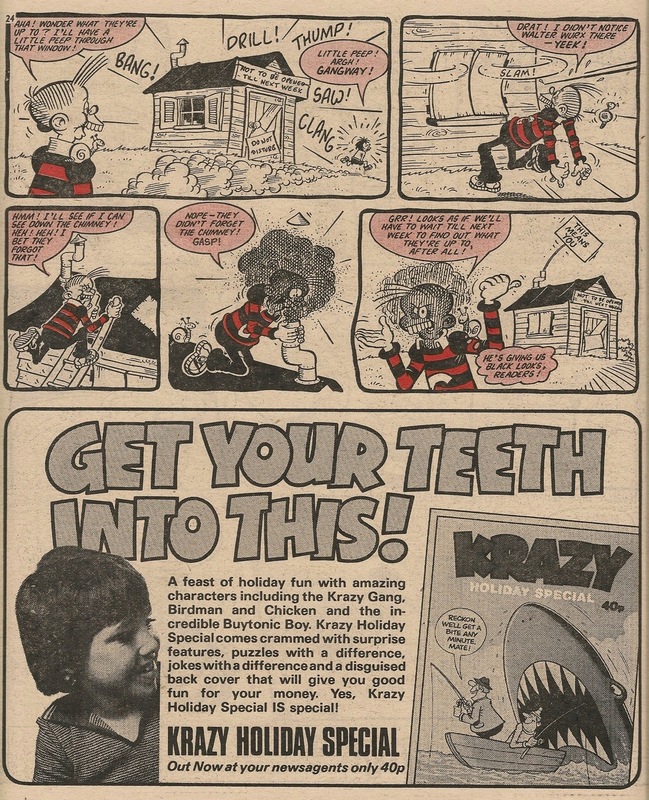 This is the week that thirsty fans of the toothy funster have been waiting for since the IPC/Kellogg's free milkshake promotion was announced in the 21 April 1979 issue. Cheeky Weekly is the fourth and penultimate participating title to give away a sachet of drink mix. I evidently consumed said drink and didn't keep the empty packet, and other than this page, there doesn't seem to be any online resource offering more information about this particular brand of milk flavouring. 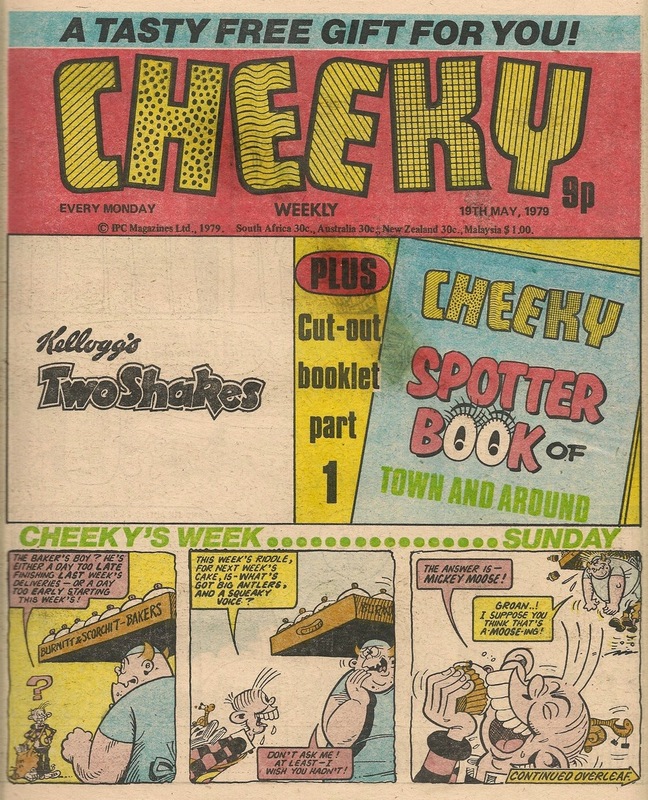 As has been the case with the other titles that carried free milkshakes, this gift-bearing issue of Cheeky Weekly coincides with the launch of a multi-part cut-out feature designed to retain any kids lured into buying this edition just to bag the freebie. Each title featured a Spotter Book on a different topic, and the subject of Cheeky Weekly's Spotter Book is the rather vague 'Town and Around'. This is the second such book to appear in the comic - the first was the Cheeky Spotter Book of Fun. Considering the prominent dairy element of this front page, one might have expected Milkie to join the toothy funster for the cover gag, but the mirthful milk-deliverer is in fact absent from the entire issue, leaving our grinning pal to commence this week's frivolities with Baker's Boy. 6 Million Dollar Gran's story is reduced to 2 pages this week, and one might assume that this truncation is due to the presence of the Spotter Book if it wasn't for the appearance of a Tease Break filler where the third page of Gran's tale would normally be. On page 8 is a rather unusual ad which requires the reader to do some work to discover the name of the advertiser. This week's Star Guest spot features the paternal reminiscences of Dads As Lads from Whoopee! On Wednesday Cheeky receives a smutty issue of the Mystery Comic (but only because Zoot Soot the chimney sweep is the donor). Having blown the ashy deposits off the perplexing publication, Cheeky enjoys a Tub episode featuring a cameo appearance by another of the Mystery Comic's stars. 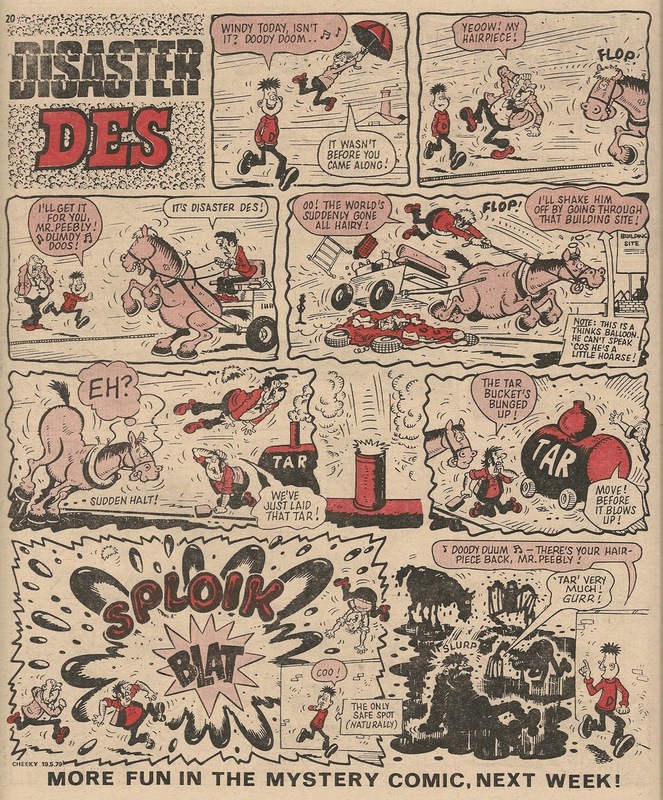 Normal Mystery Comic proceedings are interrupted by the presence of the Spotter Book on its centre pages and the comic-within-a-comic rounds off with an enjoyably daft Disaster Des episode. Love the Sploik and Blat, both of which are surprisingly devoid of exclamation marks. Elephant on the Run and Why, Dad, Why? are absent this week due to the pressure on space resulting from the Spotter Book and an ad for Trebor Chews. Returning to the Cheeky section of the comic, there's evidence of some alteration to the artwork on the Thursday page as the final panel is drawn by Jimmy Hansen (his first work on a Cheeky's Week page) whereas the rest of the page is by Frank McDiarmid. Jimmy's panel serves as an intro to a half page teaser for something coming next week. After Cheeky's visit to the Vicar's Jumble Sale on Saturday, the comic concludes with another Burpo Special, this time focusing on Doodle Doug. Artwork duties on the Cheeky's Week pages this issue are shared by Frank McDiarmid and Jimmy Hansen who contribute 10 and 2 elements (or parts thereof in the case of the main Thursday page) respectively. There was no Tuesday page in the issue of Cheeky Weekly dated 31 December 1977 (that year's Christmas edition). A caption at the top of page 14 informed readers that the toothy funster slept through the whole of Tuesday. Cheeky had been previously seen in that issue at the Vicar's Boxing Day party, so it would appear that our grinning pal had overindulged on jelly and ice cream. A Cheeky's Week page without the toothy funster could have been quite interesting, but IPC's management had other plans and it was replaced by an announcement that would have readers either groaning, or else readying their scissors, in anticipation of The Cheeky Spotter Book of Fun, part one of which would appear in the following week's comic. 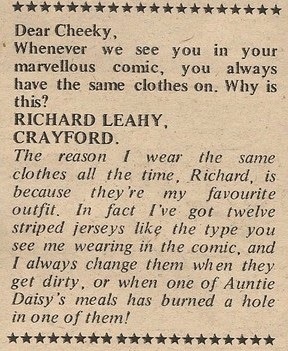 Readers contemplating dropping Cheeky Weekly in favour of sister comics Whizzer and Chips, Krazy or Whoopee! over the next four weeks in order to avoid the forthcoming pamphlet were thwarted by IPC's decision to run cut-out booklets (on different topics) in those titles as well. Judging by the frequency with which they used them, IPC must have found their cut-out feature promotions to be successful. The book was launched with full front-cover treatment in Cheeky Weekly dated 07 January 1978 as the toothy funster announced 'Hey, Pals! You'll have some fun with this!'. Loyal Friends of Cheeky who stuck with the toothy funster's title would have found that this cut-out book actually wasn't half bad. Instead of one of those rather worthy keep-the-kids-quiet-in-the-back-of-the-car style of books in which junior travellers won a point every time they spied a post box, The Spotter Book of Fun was a humorous affair featuring Cheeky and his pals, plus it had the considerable bonus of being drawn by the great Jim Petrie, most famous for his long run on Minnie the Minx in DC Thomson's The Beano. My copy of the Book of Fun's cover (above) has what appears to be a printing error that renders the unfortunate spotty kid even more severely afflicted as he seems to have contracted jaundice in addition to raging acne. It's evidently highly contagious as Cheeky's hand is developing the symptoms. These problems weren't apparent in the image of the booklet's cover on Cheeky Weekly's front page, although there does seem to be an issue with the kid's shirt. 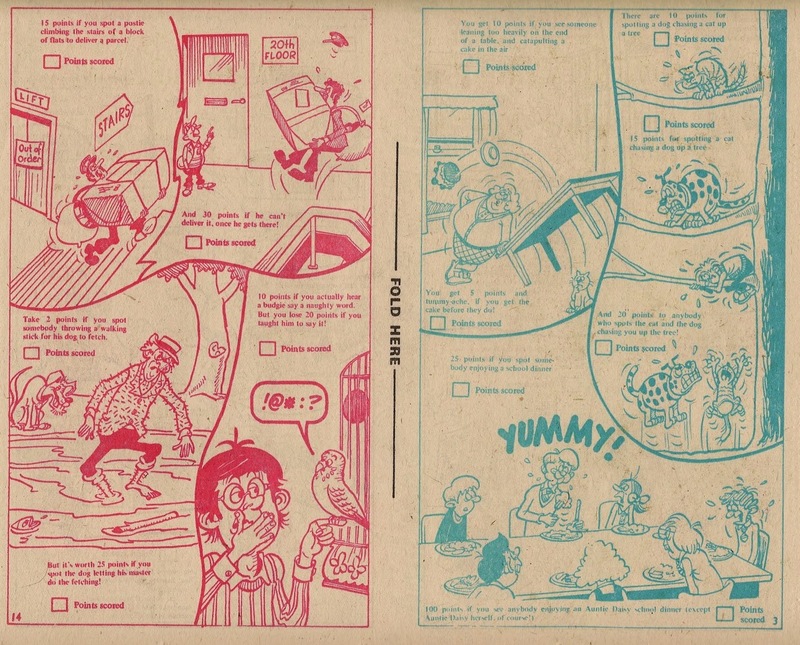 In the four Cheeky Weekly issues from 07 to 28 January 1978, pages 31 and 32 contained an installment of the Spotter Book, each printed sideways and designed to be removed, folded in half and compiled into a 16-page pamphlet. Siting the Spotter Book installments on the last two pages of the comic meant that each week the pages of the booklet printed on page 32 were in colour, although for some reason in the 14 January 1978 edition page 32 was printed in red-and-white/blue-and-white only. This was to be Jim Petrie's final work in Cheeky Weekly (his first work for the toothy funster's title appeared in an earlier cut-out series, the 1978 Diary), although he contributed most of the Cheeky pages in the 1979 Cheeky Annual which went on sale in autumn 1978. Cheeky Weekly carried another multi-part Spotter Book, 'Cheeky Spotter Book of Town and Around', in May/June 1979 but it consisted of entirely straight 'spots' of the 'score a point if you see a litter bin' variety. 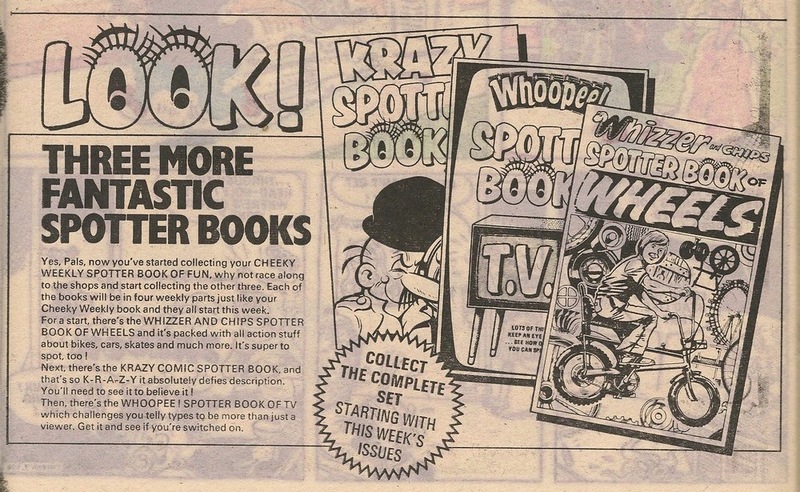 By week seven of IPC's 1979 Star Guest promotion, the dispersal of Cheeky Weekly Star Guests among the participating titles had settled into a regular pattern – odd-numbered weeks of the promotion saw representatives of the toothy funster's comic making visits to Whizzer and Chips, while Whoopee! hosted visitors from our grinning pal's title on even-numbered weeks. Thus in the promotion's seventh week it was no surprise to find Cheeky Weekly guest stars appearing in Whizzer and Chips, but maybe the choice of strip is a little unexpected, because it's Why, Dad, Why?, the strip which made a Star Guest appearance in the previous week's Whoopee!. 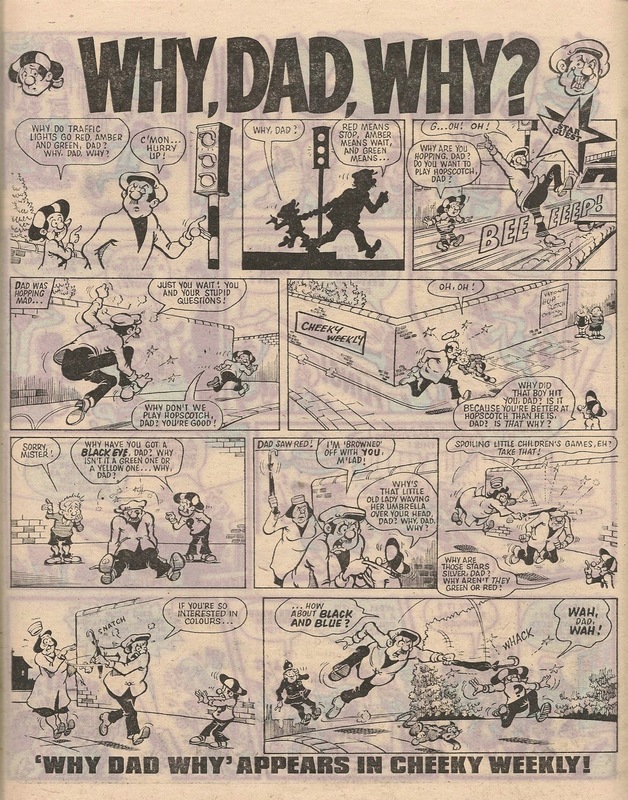 WDW was on something of a roll at this time as, in addition to appearing as a Star Guest for the second consecutive week, over in the edition of Cheeky Weekly sharing the same cover date as the issue of Whizzer and Chips from which the page below is taken, Dad and Son were for the only time promoted to the cover of the Mystery Comic. Unlike the WDW episode chosen for the strip's visit to the previous week's Whoopee!, which was less than emphatic in setting out the feature's premise, the story above highlights Son's incessant questioning, and Dad makes clear in panel four his views on this aspect of his offspring's personality. This could suggest that the page was specifically produced for use as a Star Guest rather than being selected from work intended for Cheeky Weekly (this strip was new and never appeared in the toothy funster's title). 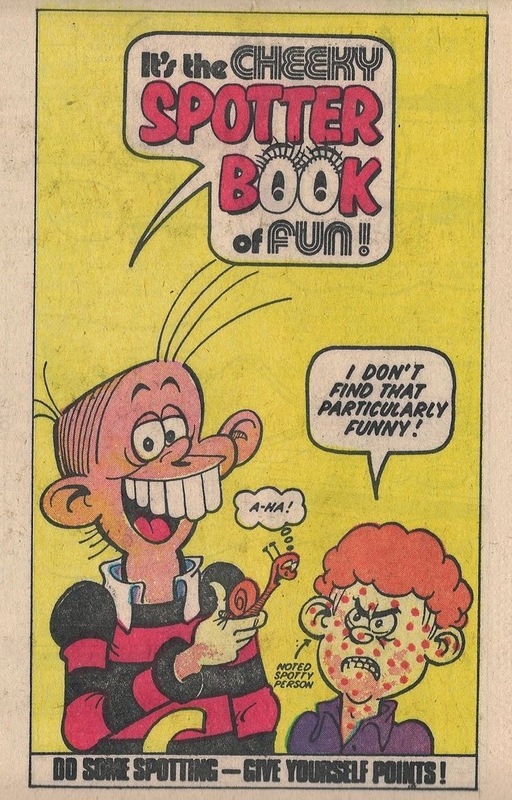 The caption at the foot of the page advises Whizz-Kids and Chip-Ites that further father-and-son fun can be had in Cheeky Weekly (the comic had already received a plug in panel five). 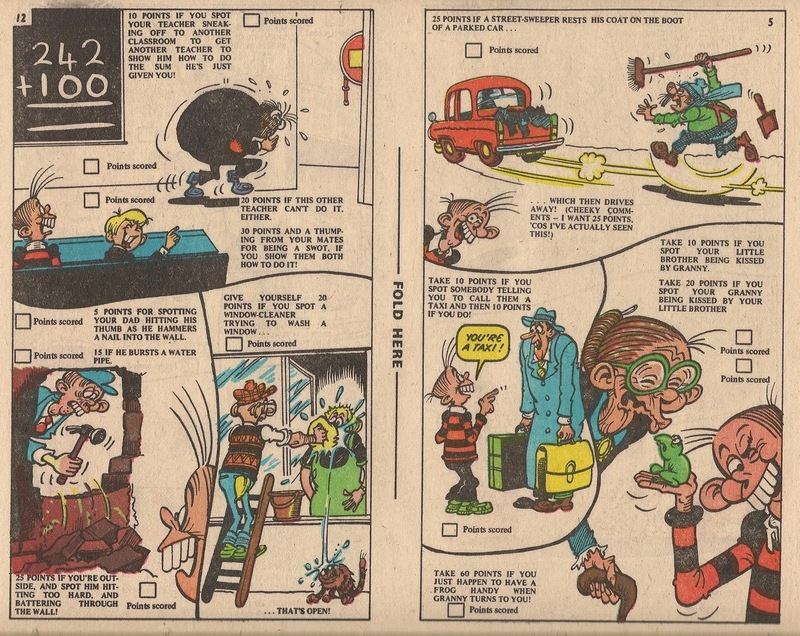 Any Whizzer and Chips readers who weren't deterred by the violence depicted in this strip and were keen to enjoy more knockabout larks of a similar nature had the opportunity (if they commenced reading our grinning pal's comic with the 12 May 1979 issue) to read a further 29 episodes before Cheeky Weekly expired and Why, Dad, Why? went into retirement. Labels: Star Guest, Why Dad Why? The self-propelled, talking Knock-Knock Door was certainly the most surreal of Cheeky's pals and definitely one of the most memorable. 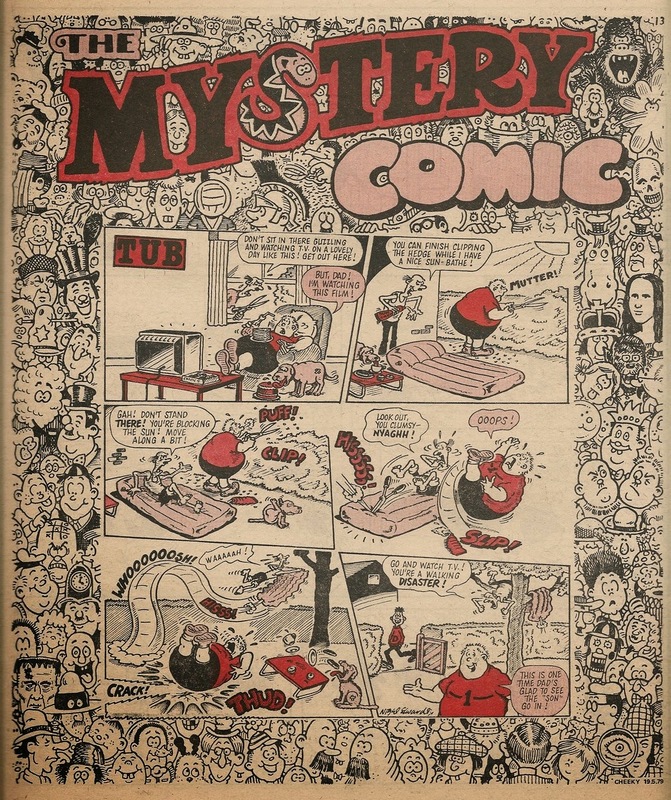 By the time the door made its Cheeky Weekly debut in the 2nd issue of the toothy funster's comic (dated 29 October 1977), the entertaining entryway was already a veteran of Krazy comic, having to that date appeared in 47 editions of the title that spawned the Cheeky phenomenon. In its first two Krazy appearances, Knock-Knock Door was situated as one would expect a door to be - within a wall - and the words 'The Door' were painted on the brickwork above it, but as of Krazy dated 30 October 1976 the door was seen propelling itself around Krazy Town on a pair of castors (as Peter Gray points out in his comment on this post, it appears Big Strong Sam\Steve was responsible for liberating the door from its brick surround), initially with 'The Door' painted on the door itself. 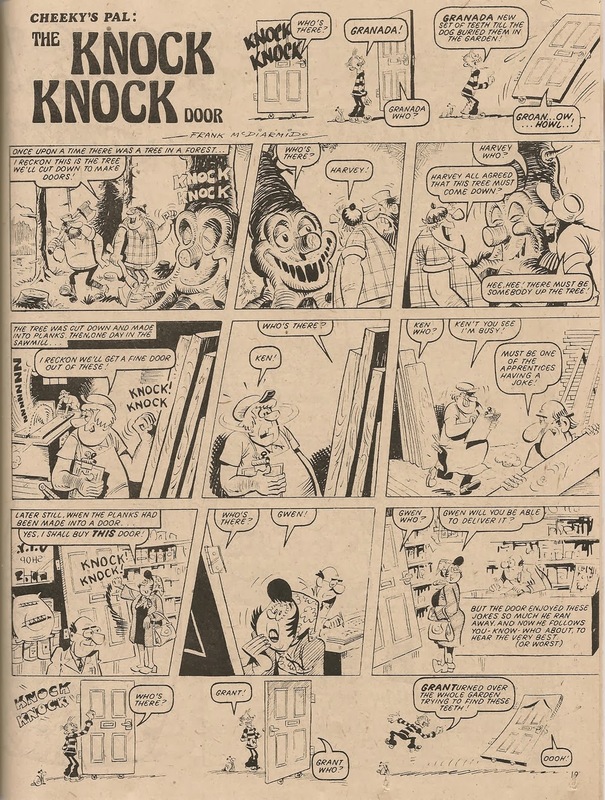 A notice reading 'Please knock knock' was affixed to the door until Krazy's 27 November 1976 issue, and the words 'The Door' ceased to appear as of the 18 December 1976 comic. 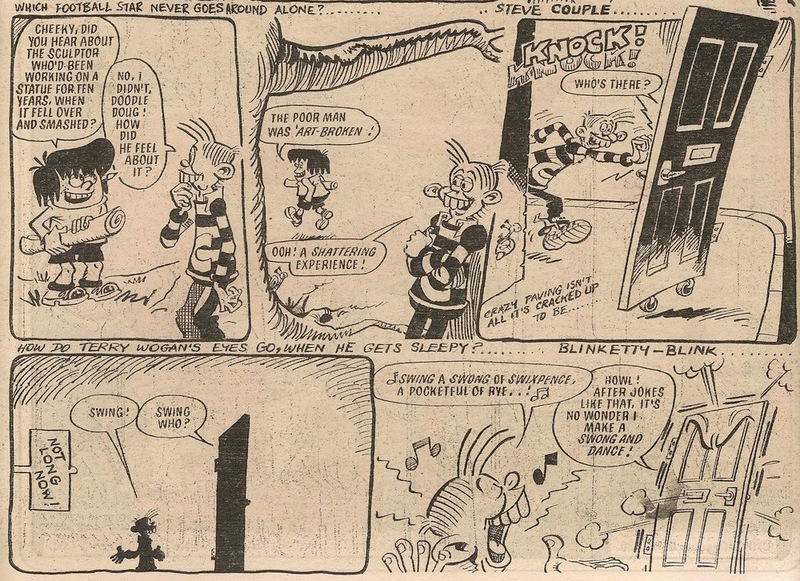 However both signs returned for a single time in Krazy's 12 February 1977 edition, and on two later occasions when Krazy covermeister Mike Lacey drew the door as the 'Ello, It's Cheeky strip made it onto the front page, Mike included the words 'The Door'. 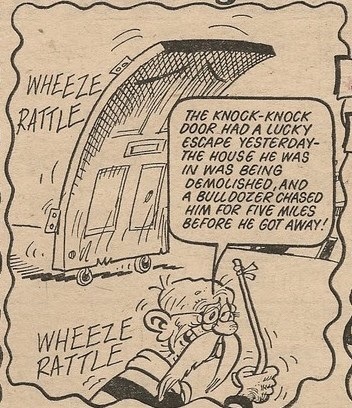 Knock-Knock Door's origin was revealed in the Cheeky's Pal strip in Krazy's 30 July 1977 issue. 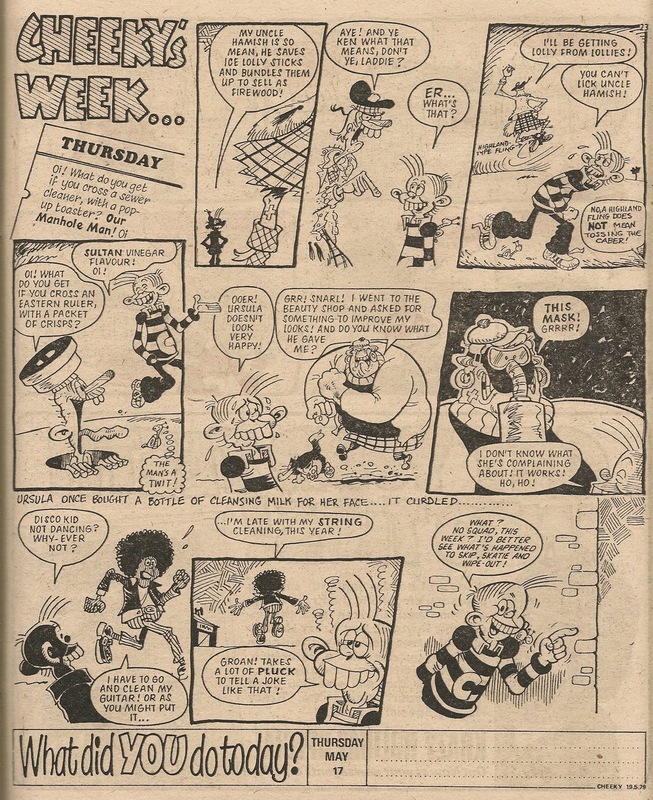 Knock-Knock Door was honoured with a second Cheeky's Pal appearance in Krazy dated 22 October 1977 (the same week in which Cheeky Weekly made its debut), but on that occasion the page consisted of a selection of knock-knock gags. 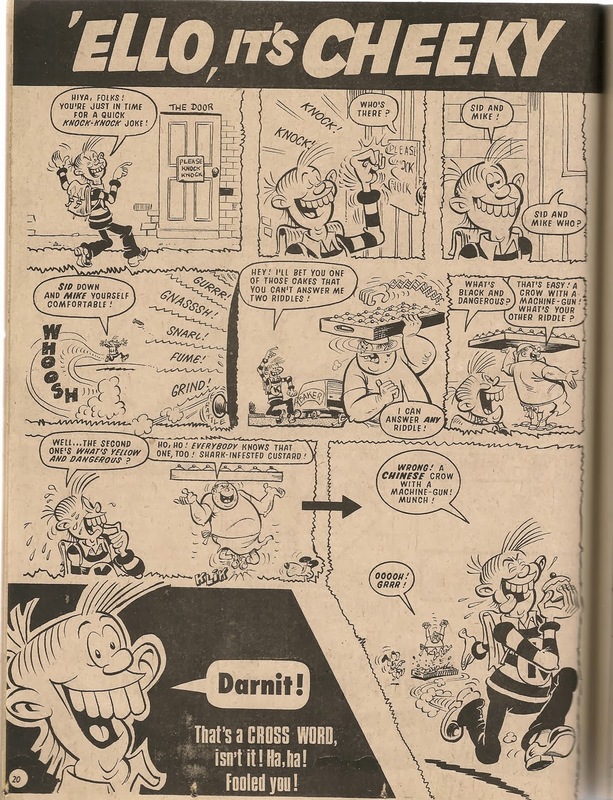 The Cheeky's Week scriptwriter clearly wasn't short of knock-knock jokes as the door appeared in 110 issues of the toothy funster's comic (although it has to be admitted that gags with the punchline 'Doorchester' were used on several occasions). Not only were there plenty of knock-knock jokes, but Cheeky would usually deliver a door-based pun when the castor-propelled portal rolled into view. In Cheeky Weekly dated 17 December 1977, Knock-Knock Door was somewhat incongruously present during the cinema interval, and in that year's Christmas issue Cheeky's wooden pal appeared with a shiny new nameplate bearing the words 'Knock-Knock Door', but the plate was never seen again. ...was contributed by reader Michael (Banjo) Bange of Dundee, whose punchline was a reference to TV presenter Eamonn Andrews, best known at the time for his work on long-running biographically-based show This Is Your Life. In the comic dated 05 August 1978 Teacher, who was suffering from some sort of mania for the duration of that edition, delivered a knock-knock gag much to Cheeky's annoyance, although order was restored when the toothy funster was able to complete a joke with the door the following day. An aged Cheeky encountered a somewhat dilapidated door in 19 August 1978's 60-years-into-the-future issue, wherein our grinning chum and his portal pal were shown to be suffering similar symptoms of the advancing years. The knock-knock joke in Cheeky Weekly dated 02 September 1978 introduced Cheeky's pal Ding-Dong Debbie, and in the 09 September 1978 Smurf issue the door had a keyhole convocation with the small cerulean songsters. The strip makes reference to a line in The Smurf Song which rather puzzled me at the time because I misheard 'small keyhole' as 'smoky hole'. The door was first elevated to cover co-star status on the front of the comic dated 14 October 1978, and returned to page one in the 18 November 1978, 27 January 1979 and 12 May 1979 issues. Knock-Knock Door was the source of The Mystery Comic for a second time in Cheeky Weekly dated 24 February 1979, and in the 31 March 1979 'Jersey' issue Knock-Knock Door was seen sporting a facsimile of the toothy funster's jumper. In the 08 September 1979 comic Six-Gun Sam delivered the knock-knock joke and in the following week's comic Cheeky allowed Granny Gumdrop, Yikky-Boo, Dan-Dan the Lavender Man and Teacher to do gags with the door. In the Christmas 1979 issue it was Cheeky's Dad's turn to do the knock-knock joke, and in the following week's issue Knock-Knock Door was seen among the guests at Cheeky's new year party. 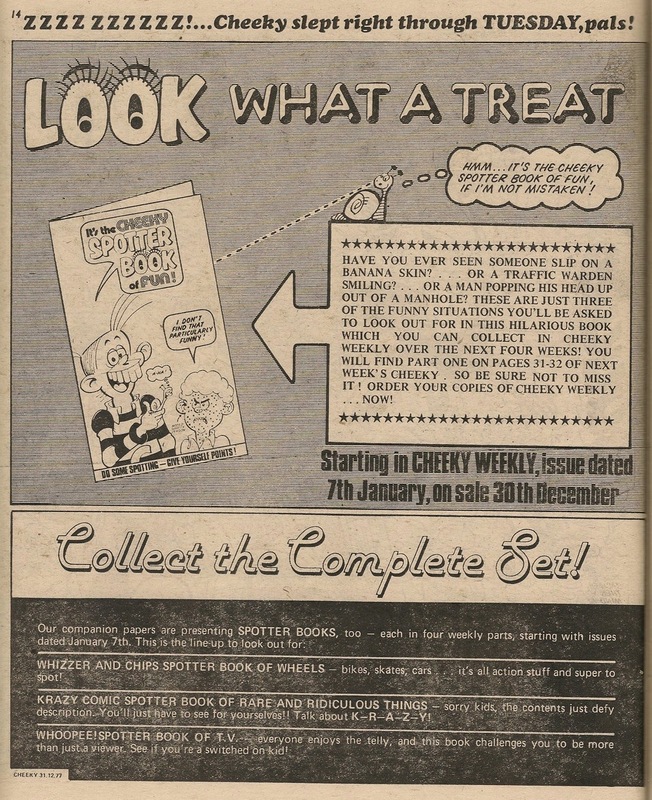 Cheeky's Cut-Out Comedy Catalogue of Knock-Knock Door Jokes appeared in the 17 November 1979 edition.